How can today’s Christian leader meet the challenges and opportunities of sharing the Good News of Christ at a time of growing religious diversity? Rev. 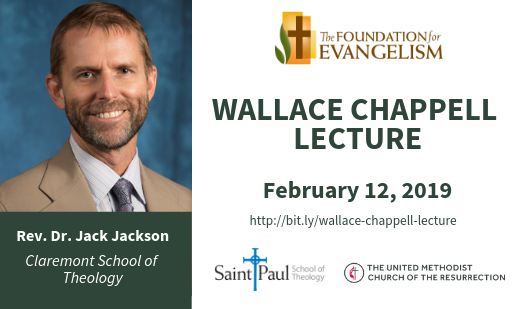 Dr. Jack Jackson, E. Stanley Associate Professor of Evangelism at Claremont University, addresses this important topic in Speaking of Jesus: Early Methodist Principles for Bearing Witness to the Christian Story in a Multi-Religious World, during the 2019 Wallace Chappell Lecture at Saint Paul School of Theology. Sponsored by the Foundation for Evangelism, the event takes place on Tuesday, February 12 at 11 a.m. in the Wesley Covenant Chapel on the Kansas campus, and will be available via live-stream at www.spst.edu/video. Dr. Jackson will give a second presentation at 6:30 p.m. on February 12 at Church of the Resurrection’s GROW Night on the topic: REVEAL: Sharing the Story of Jesus in a Multi-Religious World. One of the most pressing issues of living in a multi-religious, post-Christian world is for people of different faith traditions to build communities rather than tearing them apart. Although Christianity remains the world’s largest religion, with about 2.3 billion adherents, many dramatic changes are underway. Islam is the fastest-growing religion, and those with no religious affiliation are increasing rapidly, especially in Western Europe and North America. Dr. Jackson will draw upon an early Methodist understanding of evangelism to explore how pastors and lay leaders can reveal the story of Jesus in a way that is generous and healing. Everyone is invited to attend this timely and insightful presentation. The lecture is free and online registration is available. We look forward to seeing you there!